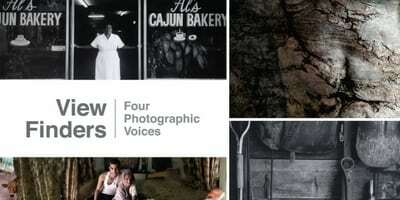 DOYLESTOWN, PA – Beginning May 26, the James A. Michener Art Museum will present View Finders: Four Photographic Voices, an exhibition showcasing the contemporary work of four photographers in the Delaware Valley: Paula Chamlee, Catherine Jansen, Brian Peterson, and Michael Smith. View Finders will be open to the public through August 26, 2018. Curated by Guest Curator Liz K. Sheehan, View Finders: Four Photographic Voices will include Chamlee’s incisive studies of surface and place; a selection from Jansen’s project 1008, an “experiential journey into sacred storytelling” created in more than 25 trips to India; Peterson’s melodic explorations of nature and light; and a range of Smith’s rarely exhibited portraits from across the globe. On the occasion of the Michener’s 30th anniversary, View Finders celebrates the contributions of these artists and recognizes photography as a significant force in the legacy of the region. In concert with the exhibition, the Michener will also present lectures and/or gallery talks by each artist. Brian Peterson, the Michener’s former chief curator, will present a three-part lecture series. For details, visit MichenerArtMuseum.org. “Despite their differences in process, technique, and equipment, all four artists emphasize the power of photography to represent connection and to communicate an experience of environment, energy, and spirit,” said Sheehan. The James A. Michener Art Museum collects, preserves, interprets and exhibits American art, and promotes the work of nationally and internationally known Delaware Valley artists of all eras and creative disciplines. The museum presents exhibitions that explore a variety of artistic expressions and offers diverse educational programs that develop a lifelong involvement in the arts. Throughout the year, the Michener Art Museum hosts a wide range of programs open to the public, including lectures, artists conversations, gallery talks, artist studio tours, dance performances, jazz and other musical performances, family-themed activities, and other events. The museum also offers a diverse selection of art classes for children and adults, which include instruction in drawing, painting, sculpting, and printmaking as well as programs for the public, schools, and teachers designed to support arts and STEAM education. The James A. Michener Art Museum is accredited by the American Alliance of Museums.